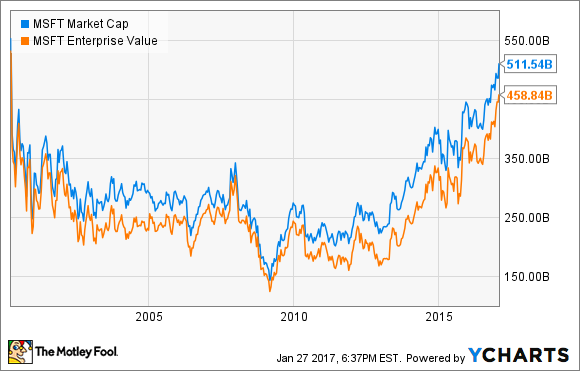 17 Years Later, Microsoft Corp. Is Worth $500 Billion Again! That's a cool milestone, bro. Mind if I poke a few holes in it? Microsoft (NASDAQ:MSFT) is putting some pep back in its step these days. On Friday, Reuters pointed out that the software giant's market cap has risen above $500 billion for the first time since March 2000. I'm all for celebrating neat milestones, including this 17-year benchmark. And it's no secret that Microsoft really is doing a lot of things right these days. Large-cap stocks don't post market-crushing 55% returns in two years for no reason. That being said, I would like to argue that the Microsoft you see today is miles removed from the $500 billion beast you knew 17 years ago. Horace Chow, Microsoft's general manager of Hong Kong operations, illustrating "transformation" on stage. Image source: Microsoft. The buying power of $500 billion in 2016 dollars works out to just $363 billion of inflation-adjusted 2000 currency. Conversely, $500 billion then is the equivalent of roughly $697 billion in today's dollars. From this perspective, Microsoft would need a market cap boost of 37% from today's total in order to make up for the inflation effect. Okay, nobody sets up milestones and goalposts at $697 billion. We want nice, round numbers. But if you don't consider inflation-based erosion over the long run, you're doing a disservice to your investments. It's real. Market cap is the easy way out. You simply multiply current share prices by the number of shares outstanding. Handy for discussion and popular at every cocktail party, market cap is one of those metrics you can lean on for quick comparisons. But it's also an overly simplistic measurement in many ways. Let's say you actually wanted to buy all of Microsoft. You (or the cabal of multi-billionaires and cash-rich companies you're working with) would then have to take over all of Microsoft's debts, because lenders and bondholders won't just drop their claims when the takeover happens. On the upside, you also get to keep all of Microsoft's cash equivalents, which is kind of like buying a nice wallet and finding a hundred-dollar bill inside. Now we're looking at the enterprise value instead. The market cap is just a starting point, followed by adding the company's debt balances and subtracting its cash reserves. This (plus an appropriate buyout premium) would be the true price tag in a takeover. Honestly, there's always more to say about a business as complex as Microsoft. I'm not here to write a book today, so let's keep this short and sweet. The company's dividend policy is just 13 years old, but now provides a decent 2.4% yield. 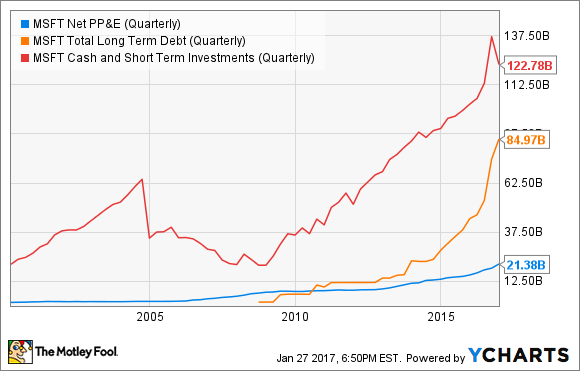 And Microsoft's balance sheet was free of long-term debt 17 years ago, but that changed in 2009. 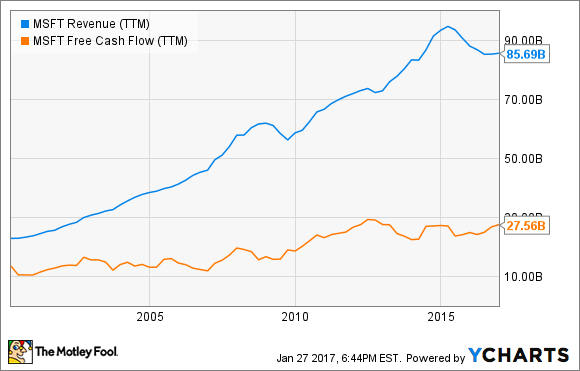 The current statement of financial accounts has very little in common with the lean, low-capital version it wielded in 2000. Cash and debt balances have skyrocketed in recent years, and Microsoft has started amassing a generous chunk of plant, property, and equipment assets (PP&E in the chart below). MSFT Net PP&E (Quarterly) data by YCharts. Any way you slice it, the rejuvenated version of Microsoft shares few characteristics with the older owner of a $500 billion market cap. The world has changed, the software industry never stops changing, and Microsoft is forever busy adjusting to new realities. So if your opinions and investment thesis regarding Microsoft haven't changed in 17 years, I'm sorry to say that the company did not just hop in a time machine to skip the last 17 years. You'll have some reading to do if you want to keep up.